i have a big problem ! When i end to work on a Raw file in Capture One (with Prophoto and Perceptive mode as soft proofing), i use the "Edit with" function to open the file in Photoshop CC as a Tiff 16 bits Prophoto file. Without doing nothing, when i compare the Tiff and the Raw in Capture One, the contrast and colors are off ! Is it me doing something wrong ? I have no solution. Last edited by Naninou on Fri Oct 09, 2015 12:28 pm, edited 3 times in total. Moreover, the file have an other look in Photoshop, nearly like the Tiff look in Capture One with -0,2 Exposure. I never had this problem using Lightroom. I add that i work on a Macbook Pro Retina with OS X 10.10.5 and Capture One 8.3.3. Even if i export the file in Jpeg sRGB and import it back into Capture One, i see the same problem : i loose saturation and the shadows raise up. When i work on my Fujifilm X-T1 Raw file, i have the Soft-Proofing set as Profoto and Perceptive. Is there an option i don't know ? Please, i need help soon as my studio has to be closed until the problem is solved. Coming from Lightroom, i never had this kind of problem. What happens with Lightroom really isn't relevant, but you're describing a known problem which has been raised by several other forum members. No solution has been forthcoming as yet, although I think it has been confirmed by Phase One staff as an accepted bug: it will presumably be fixed by the next release, but you'll only find out for sure by raising a support case. My biggest problem is that it is what i get in Photoshop too ! Even if i export a Jpeg in sRGB. It has to be something wrong with me as i can't imagine that i am the only one seeing this. I am unable to have the same contrasts and colors in Photoshop, here is the biggest problem. This is an exemple. I ended my work on the Fujifilm X-T1 Raw file in Capture One (with soft-proofing as ProPhoto and Relative) and so exported it as a Tiff 16 bits ProPhoto file for opening it in Photoshop. Nothing was made in Photoshop and i am in Prophoto color space. As you can see in this screenshot, we loose saturation in the blue jacket and the blacks raise up. This is my biggest problem and i can't imagine being the only one seeing this. It has to be my fault but which one ? Whatever the remaining shortcomings of CO1 color management, what you are experiencing is not related to CO1 persé. Tiff files that are properly exported in a large color space and viewed in Photoshop, shóuld closely match the raw preview in CO1. -If so, is Photoshop using the right monitor profile? -Is the proof profile set in CO1 the output profile? (prophoto in your case). It appears you have got this set right. So you could choose a normal output processing instead of the "edit-with" command. Brightening of the shadows with tiff and jpeg images however ís a CO1 bug. I have a lot of color issues when bringing TIFF and JPEG into CO. Loss of saturation, changes in brightness and tint. (Support case filed and confirmed.) Therefore this doesn't surprise me. And the bigger the color space, the bigger the problem. Maybe it is because CO states "TIFF File neutral" and "Jpeg File neutral" as their profile? And I cannot set AdobeRGB, sRGB or others manually, because they are output profiles, not input profiles? I don't know for sure, but CO seems to drop the profile and treat them like 'neutral' instead. But I have not seen any issues on 'Export' and 'Edit With' from Canon RAW. I tried them with Profoto profile now, 16 bit TIFF out into PS with one of my images. The colors match nicely. I've had them side by side, just like the example shown here. In my little experiment, I cannot reproduce your problem. There must be something else going on. A big thank you to take time to help me finding the error. You will find all the details about my color management settings in the video. I can reproduce the same problem with others files including some saturated blue. I tried to replicate the problem in Lightroom making some equal development settings and sending the file into Photoshop but here the contrast and color are perfectly equal. I can't find the problem, as the support tells me that i should be my fault. what you see is one of the still unsolved fundamental flaws of c1 - images with strong chroma noise/artifacts are displayed incorrect in any view other than 100 %. from my experience the drift is related to the amount of chroma noise the image contains. LR has no problem in this regard. this issue is not related to color-management or file formats ! 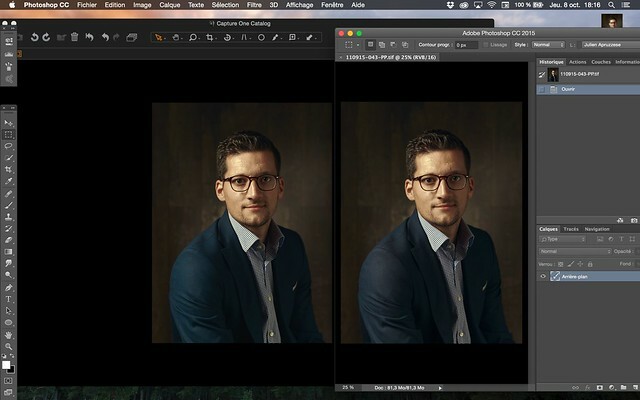 Yes, you have to be really careful of the previews from CO. DO NOT compare CO images to PS image except at 100%. Each program is going to have their own scaling from full image to the screen image, and I find CO's to be the worse. I think the issue is most other program works with the full res of the image, (Aperture and I believe by default LR always generate FULL res previews, and of course PS is always using the full res. ), while CO uses a scaled preview, that they suggest you set to your screen size. So when CO show previews at screen resolutions it is using the JPEG preview with the adjustment applied, not applying the adjustments to the full res then scaling down. I would like to thank everyone who helped me understand the problem and apologize for the late answer. The fact is before to understand what was going on i had to close the studio for several days and so i have accumulated a delay for my clients. I will comme back to this thread in several days to talk more about this problem.